The Israeli intelligence community has earned a worldwide reputation for excellence. Through its professionalism, daring and creativity, it has made important contributions to intelligence services around the world in the struggle against global terrorism. But how much is known about it? How was it built? What are its areas of activity –and what are the secrets of its success? In Israel’s Silent Defender, Brigadier Generals (Res.) Amos Gilboa and Ephraim Lapid have compiled thirty-seven essays written by experts and leaders of Israeli intelligence, among them high-ranking analysts and J2s, commanders of human intelligence (HUMINT), signal intelligence (SIGINT), visual intelligence (VISINT) and open source intelligence (OSINT) units, and heads of the Israel Defense Intelligence (IDI), the Mossad and the Shabak. 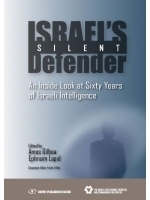 This book is a project of the Israel Intelligence Heritage and Commemoration Center and dedicated to the memory of Meir Amit, who was both head of the Mossad and director of IDI. It is published in memory of the fallen heroes of the intelligence community, with profound appreciation for its founders – those who laid the groundwork for the security of the State of Israel. From the Jewish state’s rebirth nearly two-thirds of a century ago until today, Israel's intelligence services have had the hardest intelligence job in the world: protect an open democracy surrounded by largely hostile states that are populated by citizens taught from childhood that Israel should not exist. This stunning book sets a standard of candor, remarkable for the intelligence world, about both these services’ successes and their failures, and also about how intelligence today is acquired and used – a standard that no other work, in any country, comes close to matching. This book offers its readers a close look at the essence of the Israeli intelligence organization, one of the best and most experienced in the world. It is imperative that professionals throughout the world gain a better understanding of the challenges that Israel faces and the answers that Israel offers the world, in contending with terrorism and threats confronting not only Israel but the entire world today.